This event was held from 6.30pm on Monday, 21 January 2019 at Salvation Army Regent Hall, 275 Oxford St, Mayfair, London W1C 2DJ. 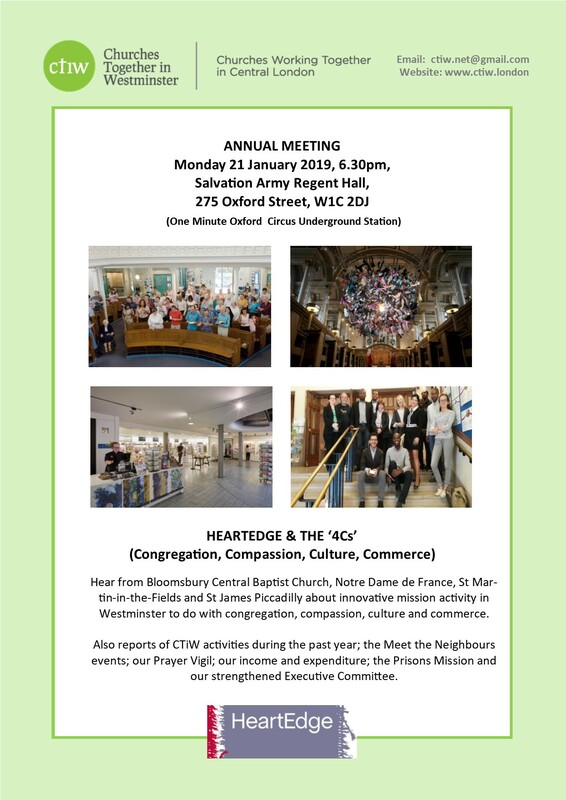 HeartEdge has been initiated by St Martin-in-the-Fields and churches in Westminster have been early adopters in the movement. We heard from churches such as Bloomsbury Central Baptist Church and Notre Dame de France about the reasons why they have joined HeartEdge and of mission initiatives to do with congregation, compassion, culture and commerce. This was an opportunity to hear about innovative mission activity in Westminster and to explore the ways in which integrated approaches to mission impact communities. It is hoped that texts from the speakers will be added shortly. Our grateful thanks to Regent Hall Salvation Army for hosting the meeting, and to everyone who contributed.